The App Stores have a large collection of games for people with an insatiable thirst for knowledge. If you want to kill time productively, play a word game on your mobile device. 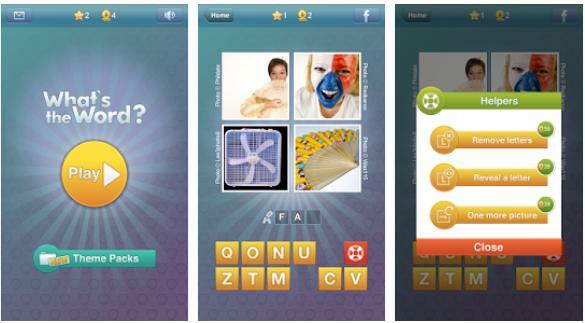 Word Games available for download on the App Stores can help you learn new words and build vocabulary. 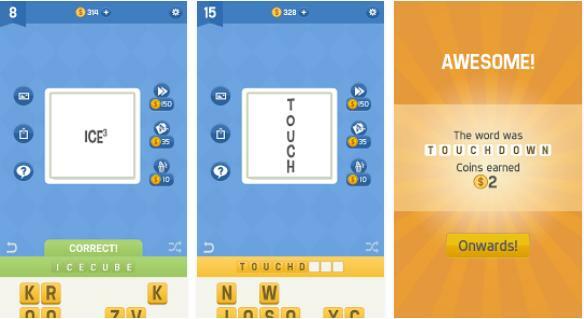 These games are suitable for knowledge-hungry people who want to pass time and test their knowledge of English words. They are lightweight and fun to play. Most importantly, the games are short and you can play them offline. 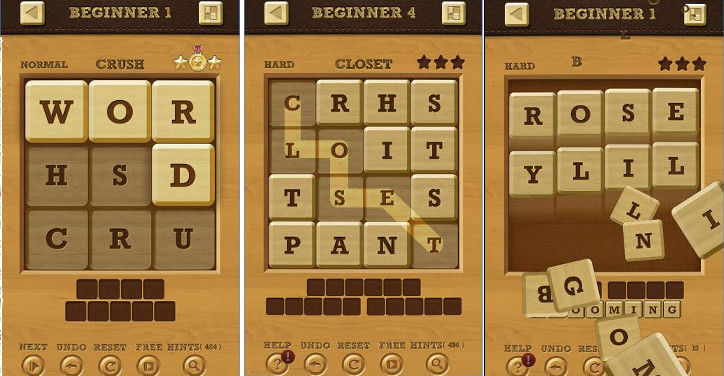 Word Cookies is one of the best word games for Android and iPhone. Although the game has no connection with food, people who love eating or cooking will love it. 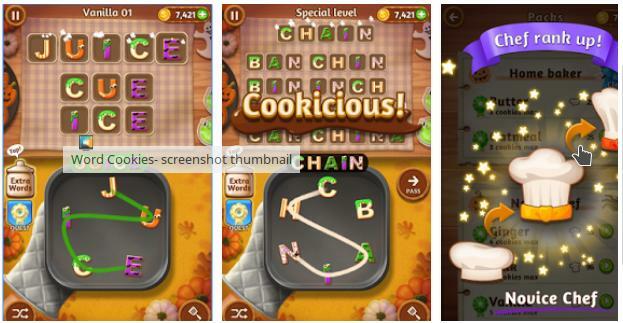 Word Cookies is a kitchen-themed single player game that displays letters scattered in a pan. Besides the pan, you’ll find a large tray with empty blocks. To form a word and to fill the blocks, you must swipe the letters. The WC game has the option to shuffle letters. It rewards users with points when they complete a puzzle. You can use these points to see the hints. If you’ve exhausted the points, you can buy them with the game’s in-app purchase module. The game has many levels. Initial puzzles are easy to solve as you have to build 2 or 3 letter words. The game becomes challenging when you’re asked to form 3+ letter words. WC includes 4 themes. It can sync your scores with Facebook. It lets users turn off the in-game music and disable notifications. The game is suitable for all age groups and it is addictive. PicToWord is a top-rated word game which you can play on your iPhone or Android device. The app displays two pictures and 14 tiles. The tiles aren’t empty. Each tile boasts a different alphabet. Above the tiles, you’ll find a row of empty blocks. You must look at the two images carefully and fill the empty blocks with letters to build the right word. For example, if you see the picture of a leg and a ball, you must tap the alphabets “F”, “O”, “O”, “T”, “B”, “A”, “L”, “L”. You’ll earn coins for each correct answer. If you’re unable to solve the puzzle, tap the question mark icon to see the hint. The app displays 4 hints for each puzzle. Users must spend some of their coins to see the hint. In the hint doesn’t help, users can skip the puzzle by spending 150 coins. The PicToWord game lets users earn extra coins by completing daily challenges. WordBrain is an animal and insect-themed sudoku style game in which you must find the words hidden in a rectangular grid. It has several levels. The objective of the game is to earn as many points as possible by solving the word puzzles. To select the word, you must swipe across the letters. If the word you’ve selected is correct, WordBrain will increase your points. Although WordBrain is fun to play, it can irritate the user by not accepting the user’s answer even if it is correct. When I was playing WB, the game displayed a 2 x 2 matrix with the letters “C”,”M”,”L”, and “A”. The app didn’t accept my answer “CALM”. According to WordBrain, the right answer for the puzzle was “CLAM”. Although this game can be frustrating at times, it can help you learn new words. It includes a hint system. 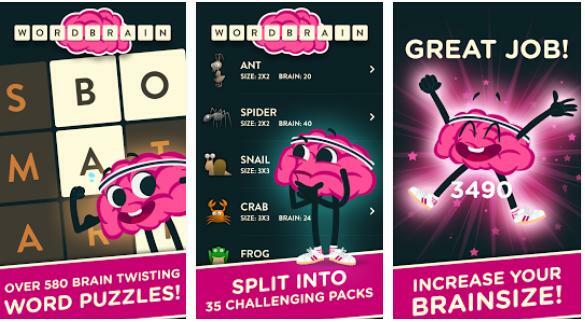 WordBrain game allows users to create new puzzle and participate in daily challenges. It supports 15 languages and has the option to turn off the game sounds. WTW is similar to PicToWord but it’s a bit more challenging. 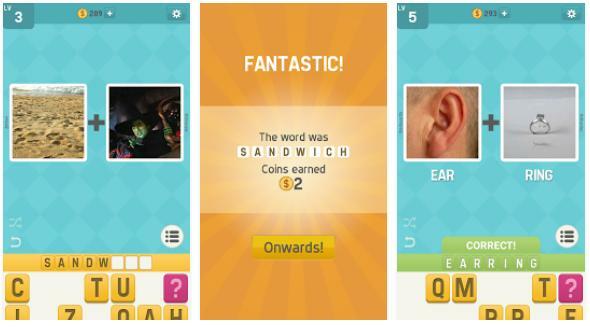 Instead of 2 images, the game displays 4 pictures and asks users to form a word. WTW game is not for kids as it may show images which are hard to understand. It doesn’t have ads. The developer has monetized this app with in-app purchases. As in other word games, you can see hints in WTW. The minimum coins you must have to unlock a hint is 39. If you don’t have enough coins, you can buy it for 0.99 USD. 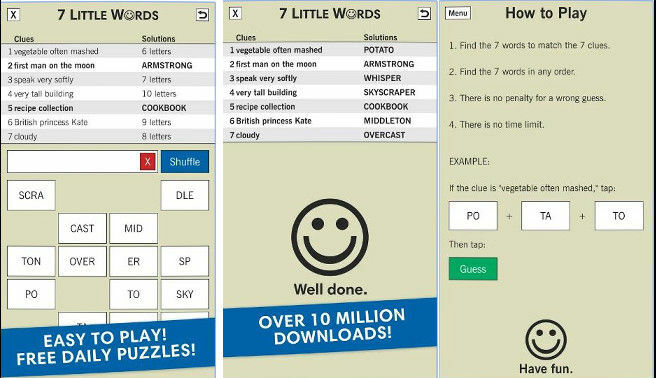 7 Little Words is a crossword style game with several challenges. It displays 7 clues and 24 combinations of letters. To build a word, you must tap on the tiles. Once you’ve formed the word, tap on the Guess button. If the answer is correct, the game will highlight the clue in bold. The game enables users to see a hint for each clue. It has a puzzle store through which you can download new puzzles. 7 Little Words ships with over 40 puzzles. It includes daily challenges for the users who have solved each puzzle of the game. Words Crush is yet another addictive Word game for Android devices. It has nice graphics. It is easy to play as well. WC has 4 difficulty levels – easy, normal, hard and extreme. Users must complete the 1st level to unlock the next level. How to play Word Crush? Well, the game will display a grid containing tiles. Each tile boasts a letter. You must swipe the tiles to build a word. You can swipe down, up, diagonally or sideways. Words Crush displays the numbers of moves you’ve taken to solve the puzzle. It has 100+ puzzles and 40 quests. PlexiWord is a clever Word game for mobile devices running on the Android OS. Phrases or Words in PlexiWord are represented by color, icons, images, etc. You must tap on the letters displayed in a grid to form a word. The object or word displayed on the screen may or may not be related to the word. If the word you’ve built is correct, the game will reward you with a point. Then, it will load a new puzzle. PlexiWord features 290+ puzzles. Unlike other Word Games we’ve shared above, PlexiWord makes you think hard. If you’re stuck at a certain point, you can see the hint. Studies have proven that games are an effective way of learning new things. If you want to discover new words or test your English vocabulary, download, install and play one of the games we’ve mentioned above.